and from Dallas, TX to Calgary, Alberta, about 2500 miles from July 13-22 of 2008). Originally called Sunrayce USA, the first race was organized and sponsored by General Motors in 1990 in an effort to promote automotive engineering and solar energy among college students. 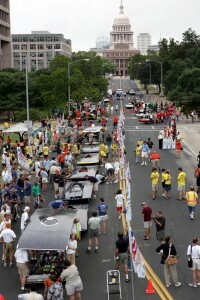 At the time, GM had just won the inaugural World Solar Challenge in Australia in 1987; rather than continue actively racing, it instead opted to sponsor collegiate events. the U.S. Department of Energy discontinued its sponsorship, resulting in no scheduled race for 2007. The race is now sponsored byToyota. The 1990 and 1993 races had a south-north orientation, intended to roughly match the Darwin-to-Adelaide, Australia, route of the World Solar Challenge. In 1995, race organizers opted for a mostly east-west route from Indianapolis to Colorado. In 2005, the ASC adopted its current route that follows a south-to-north orientation across the United States, then turns to the west upon reaching Canada. Since 1995, the Race Director has been Dan Eberle, a professor at Crowder College in Neosho, Missouri. Below are rules obtained from the Wikipedia. I will keep you posted if there should be any rules changes for this year. This entry was posted on Friday, January 13th, 2012 at 5:29 AM	and is filed under Events. You can follow any responses to this entry through the RSS 2.0 feed. You can leave a response, or trackback from your own site. Somebody essentially help to make seriously articles I would state. This is the very first time I frequented your web page and thus far? I amazed with the research you made to make this particular publish incredible. Wonderful job!